I'm continuing my tour of Christmas decorations around my house. The next stop is my dining room. I did very little in here. 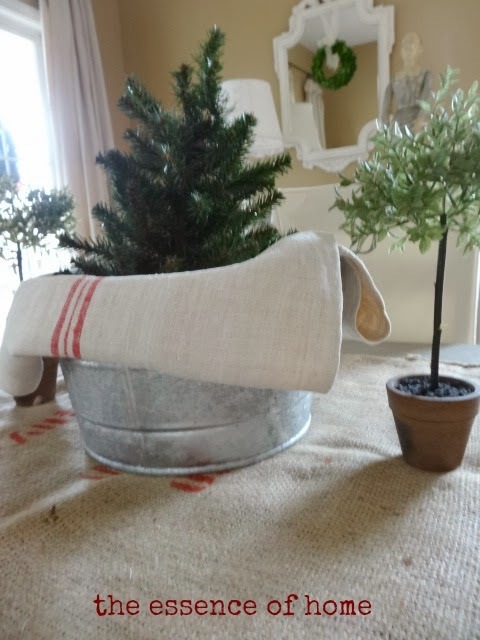 I used a simple potted tree in a galvanized tub with a vintage red and white grainsack in it for the centerpiece. It's sitting on top of an old burlap sack with red writing on it too. 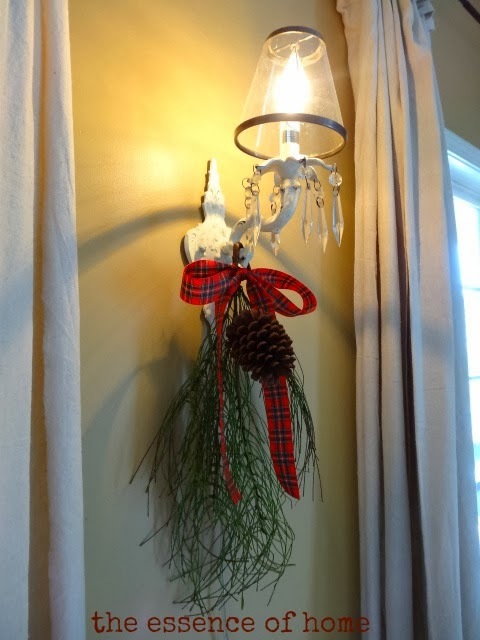 On my sconce, on the wall, I hung some pine greenery mixed with a pine cone and plaid ribbon. 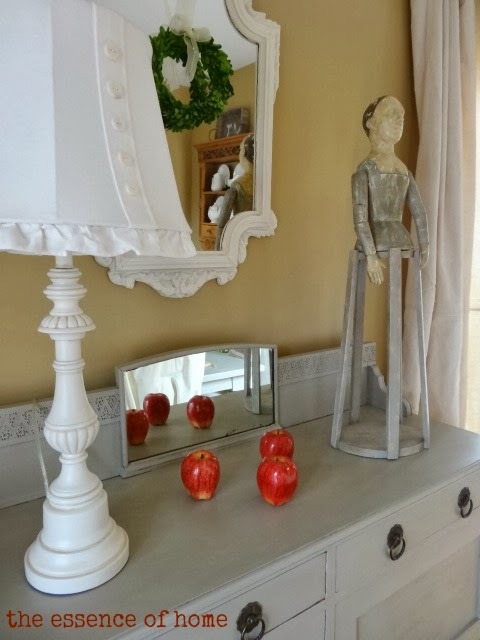 My sideboard has a few red apples on it and a small boxwood wreath hanging on the mirror above. This is my favorite thing though. My paper white bulbs have been growing like crazy. They're almost ready to bloom now! Here is the view from the foyer. Hope you enjoyed the tour! It is still ugly outside too. Is the sun shining at your house because it has been missing at mine! I kept saying I was getting paper whites, and never did. Now I'm sorry I didn't! I love the simplicity. You decorate so beautifully! Where did you get that lampshade with the buttons? Perhaps you've told and I've forgotten. The dining room looks gorgeous Kelly! Your home always looks so pretty and Christmas just shines in your rooms! 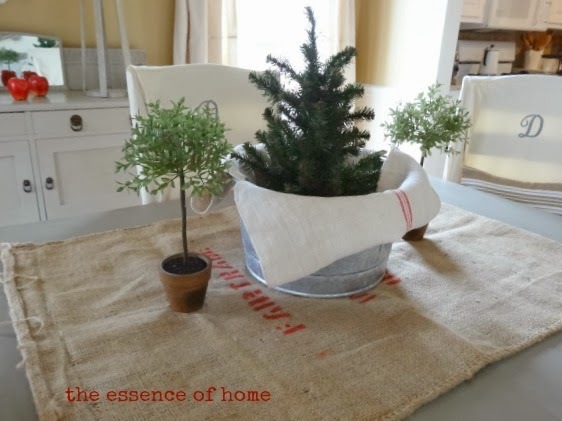 Love the burlap sack on the table! All looking good. The sun does need to return for sure. Your dining room looks great! I just ordered some white chair covers for my dining room chairs, and can't wait until they arrive. Yours look so pretty! I really like how you added the Christmas touches to the sconce. We're currently at 80 degrees here, but by this afternoon, we're supposed to be in the 40's. I can't wait! Kelly, your dining room is so pretty! Red and white is my favourite this year!! Love how you used the red and the centerpiece is cute. The sun wasn't here today at all but was warm at 60 plus rained all day. I think beauty is when you can really see things and appreciate how they look without clutter and decorating chaos. Very pretty. Very pretty Kelly...I love that rake! Very nice, Kelly. Just the right amount of festive touches. 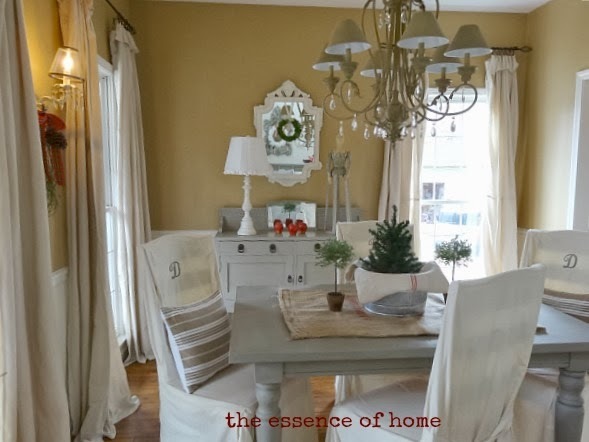 I love the understated elegance in your dining room, Kelly! 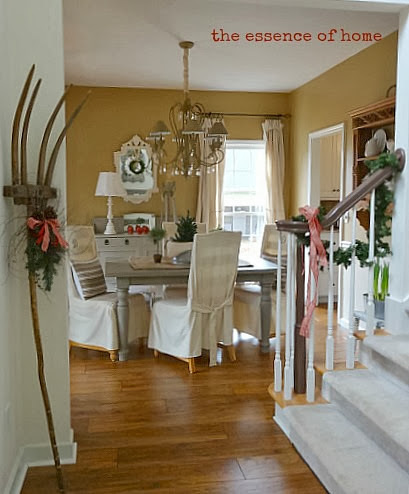 The sprig of pine tied to your wall sconce is a nice touch. Don't feel bad. The temp is dropping to -15 tonight in northern MN! I must have missed the post when you painted your railings grey. They look great! Your dining room is beautiful. I am in a funk for Christmas decorating. I stopped at the tree, garland and wooden gift boxes. You are motivating me though! Very VERY nice! Peaceful and clean looking! My place is all jam packed with every nook and cranny filled to the brim with all sorts of color. You would find my home a great place to visit but you wouldn't want to live here! The same would be true for me at your place. I LOVE the simple elegance of your lovely home. I am just a junky by nature....I can't seem to help myself! Sometimes less is more, and this is one of those times. The little tree on the table makes just the right statement. Love your sense of Christmas style, Kelly! Kelly...this is so You!! I love all the little, simple touches and yet from the view outside the dining room, you can see how festive it is!! Great job!! Everything looks great! No sun shining here...it rained early today, then freezing rain and now we are expecting 5 to 8 inches of snow tomorrow. Love your dining room. 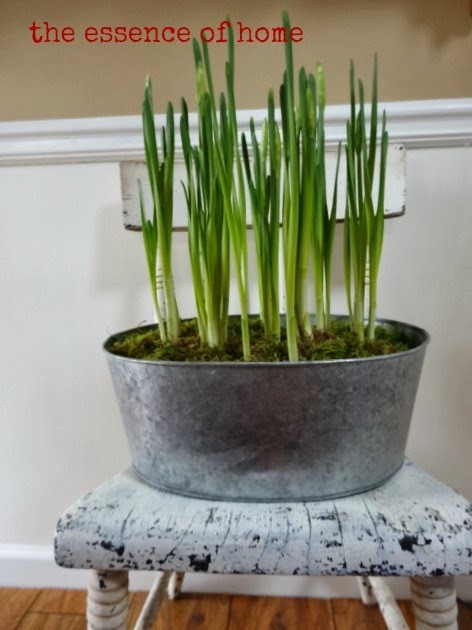 The paperwhites and decorated rake are beautiful! Very pretty!! I was just thinking this morning that I swear I can see the paper whites grow from one hour to the next!! : ) Have a wonderful weekend!! Very pretty! I like the simple accents here and there. It adds Christmas but it's not overwhelming. Very pretty room! I always love everything you do!!!! you dining room has always been one of my faves though....I know you told be that you got your slip covers from Target but I noticed a monogram on them. Did you to that yourself Kelly? Another lovely room, Kelly. We have had little sun as well. I agree that the rake is a really great piece.